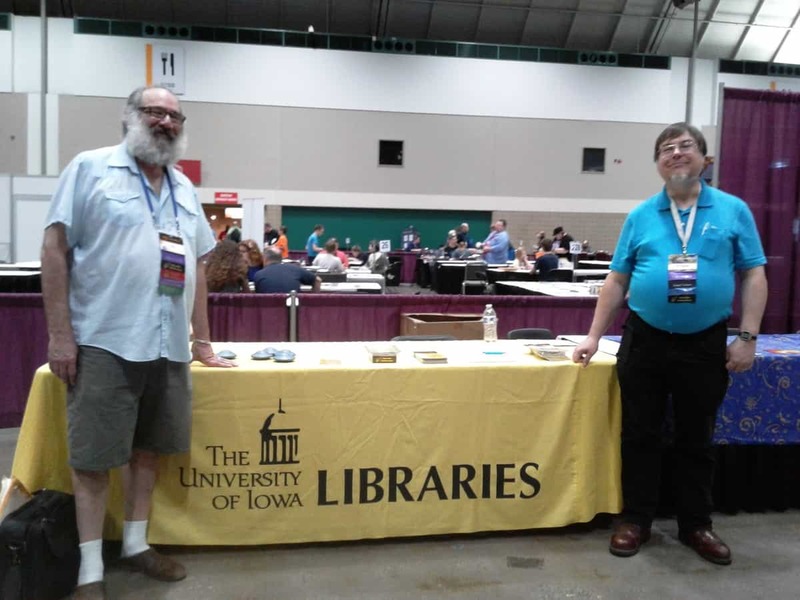 Last month on August 17-21, two of our very own, Peter Balestrieri and Laura Hampton, went to represent the University of Iowa Libraries at the 74th World Science Fiction Convention, Mid AmeriCon II, in Kansas City, Missouri. 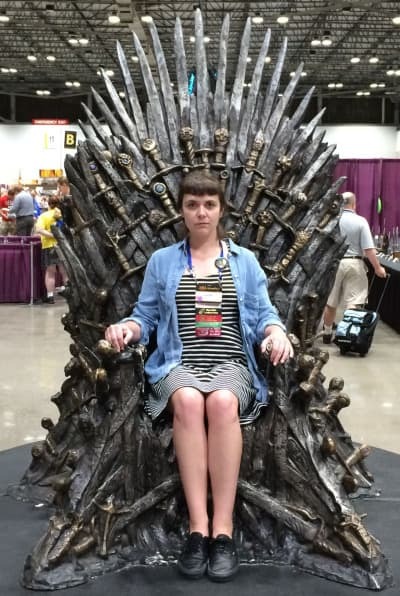 Some may wonder what a couple of Special Collections librarians were doing at a Science Fiction convention. 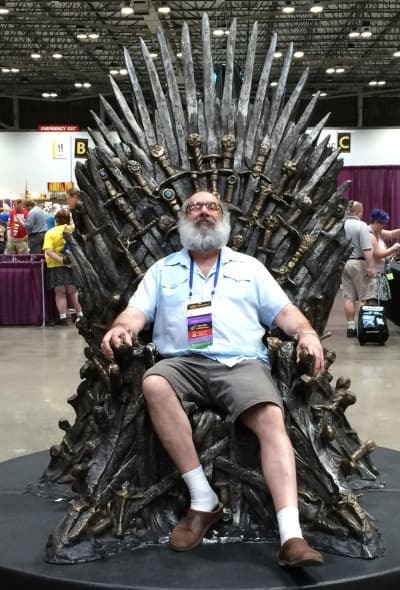 Well, they weren’t just there to recline on the Iron Throne. In fact, this will be the University of Iowa Special Collection’s second consecutive year at World Con, promoting the UI Libraries, the Hevelin Collection, the Hevelin Digitization Project, and other science fiction holdings here at the library. Balestrieri and Hampton had a UI Libraries fan table, decorated and branded with the University logo and colors, at the entrance to the dealer’s room full of fan groups, art displays, interactive activities, an enormous astronaut, and, of course, dealers. 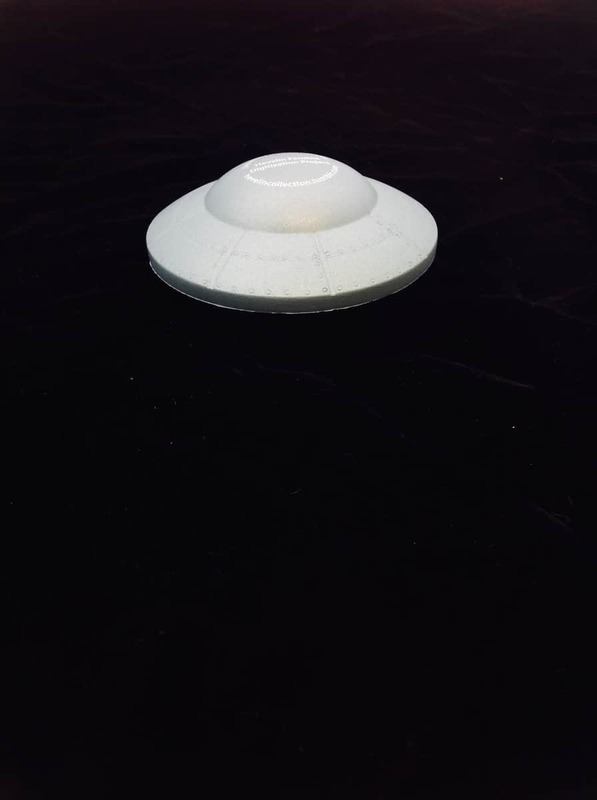 There, they chatted with attendees, gave away over 500 free branded flying saucer stress toys (see below), pencils, and badge ribbons, as well as handouts on the Special Collections science fiction holdings and projects. They got attendees to sign up to volunteer as transcribers for the Hevelin Digitization Project, collected hundreds of emails, and spoke to passersby about the UI Special Collection’s current ventures. “We were met with overwhelming praise and support for our efforts,” Balestrieri said. Special Collections may even be receiving new donations from some prominent fans and figures in science fiction and fandom in the future. However, their time at the World Con wasn’t all work and no play. Hampton was able to attend the exclusive George R.R. Martin Alfie Awards celebration. Check out some pictures and read more about this event on the Hevelin Tumblr. 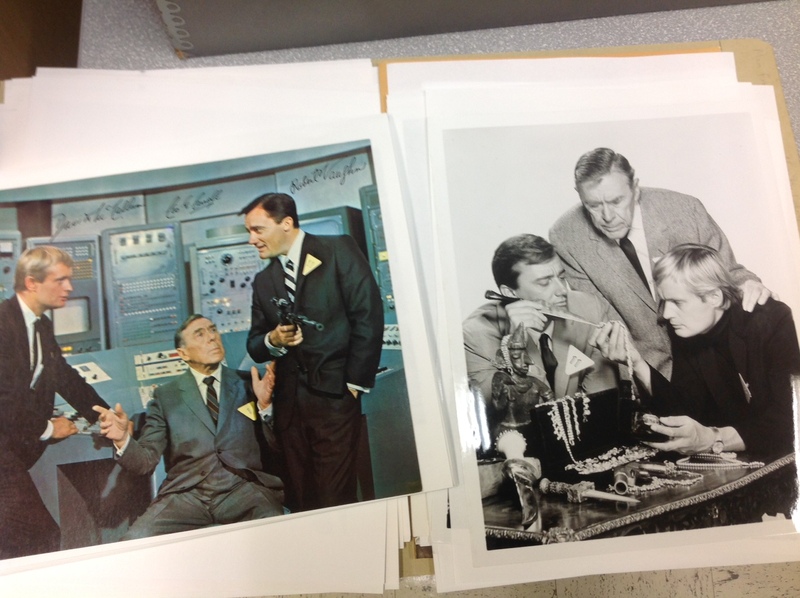 Some of the photos feature George R.R. Martin himself! Return of the Return of the Man From U.N.C.L.E. In September of 1964, a new series premiered on American television. It was a spy series influenced by Ian Fleming’s James Bond novels and the films that began with 1962’s, Dr. No. I was eleven years old at the time and couldn’t wait to see it. 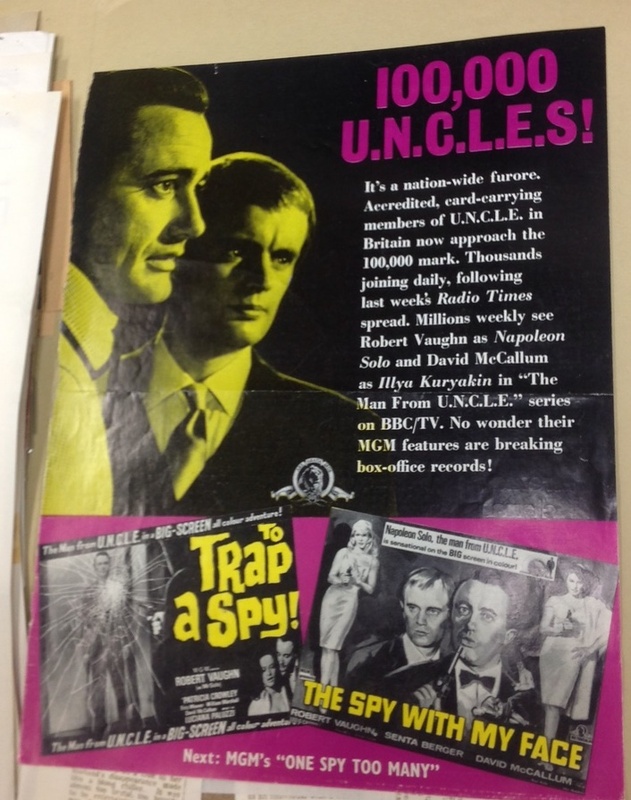 America had caught spy fever and television and Hollywood were feeding demand. 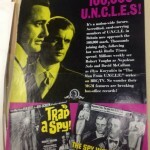 The show was called, The Man from U.N.C.L.E., and it was a major hit, the source for what is widely recognized as the first real media fandom, two years before the debut of Star Trek and Trekkies. This fandom grew and sustained itself from the 60’s through to the present, rewarded with a new film interpretation that seeks to cash in on both Boomer nostalgia and the current fascination with hyper-lethal, shadow agent heroes. 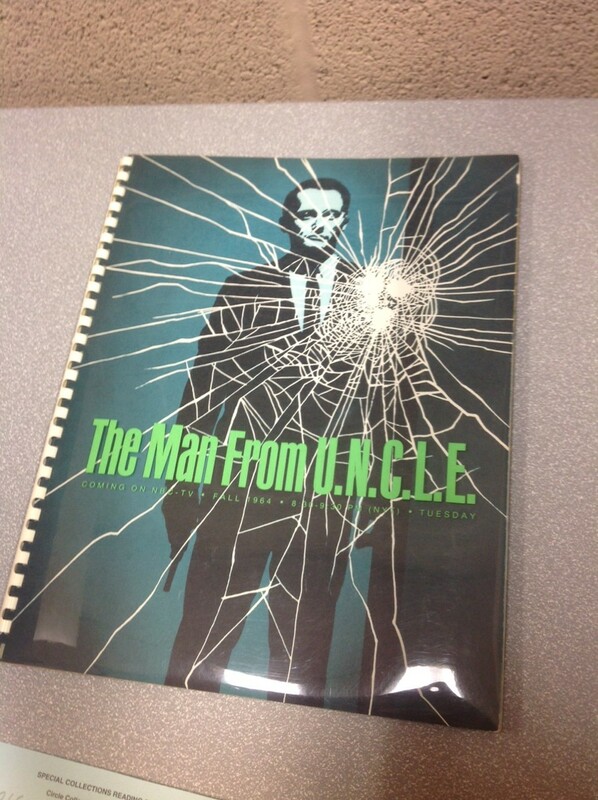 We are fortunate to hold the papers of the executive producer and co-creator of The Man from U.N.C.L.E., Norman Felton, in the University of Iowa Library’s Special Collections http://aspace.lib.uiowa.edu/repositories/2/resources/271. 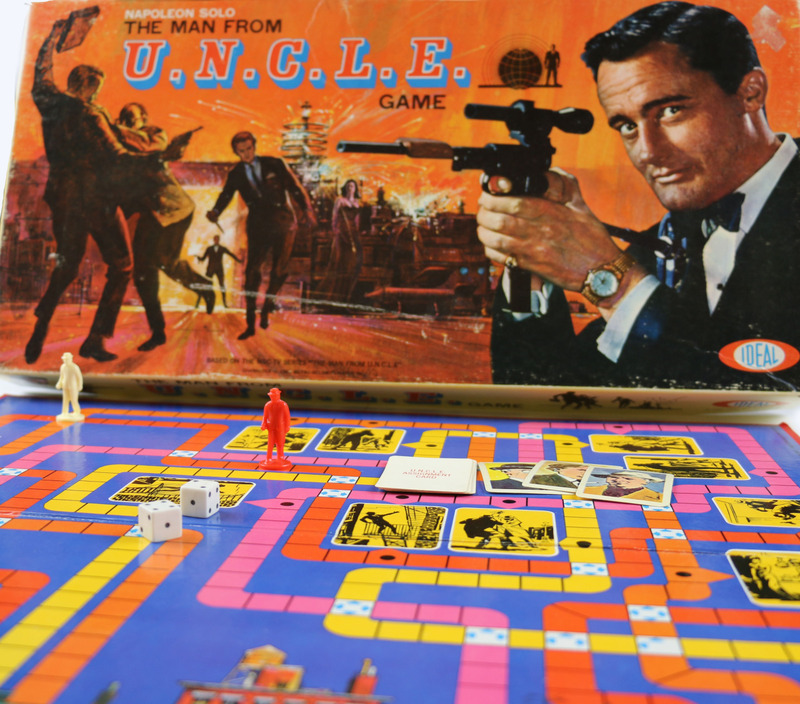 As a kid, I ran around the house with my U.N.C.L.E. gun and my U.N.C.L.E. communicator and glued myself to the screen when the show aired. Not content to be mere consumers, many teens began newsletters and fan clubs. Teenage girls were an enormous share of the show’s audience and were particularly smitten with the show’s English actor, David McCallum. He played agent Illya Kuryakin, a cool, cerebral opposite to his partner Napoleon Solo’s suave man-of-action, played by American actor Robert Vaughn (The Magnificent Seven, The Young Philadelphians). Vaughn’s character was the show’s ladies’ man but it was McCallum that pulled in record-breaking fan mail, more than Clark Gable at his most popular. By 1966, the show was a huge success and the stars of the series were on a promotional tour. They travelled to New York to appear at Macy’s department store. They were to drive their limo straight into a freight elevator and go up to meet the fans, but it was not to be. 15,000 teenage girls showed up and quickly became unmanageable. It was decided to cancel the appearance. When they learned of the cancellation, the girls rioted, doing extensive damage to Macy’s with a few injuries as well. The police influenced Vaughn and McCallum to return immediately to the West Coast. McCallum later vowed to never appear at an American promotion again, fearing that fans or he himself would be injured. This devotion didn’t end when the series was finished in 1968. It expanded into more clubs, newsletters, conventions, and fan art and fan fiction. 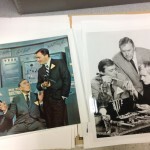 One of those fans was Lynda Mendoza and we are privileged to have her fine collection of David McCallum fan materials http://aspace.lib.uiowa.edu/repositories/2/resources/778. With the new film, U.N.C.L.E. returns to center stage in pop culture. I‘m currently binge-watching the first season of the series on DVD, enjoying it and watching with a more critical eye than I did fifty years ago. The show alternates between a self-reflexive campiness and a realism that makes it palatable to a contemporary audience. Interestingly, in light of the huge McCallum fandom, the Kuryakin character makes only intermittent appearances, sometimes not at all. Perhaps this peekaboo added to the hunger teens felt for McCallum. He was often referred to as “the blond Beatle” because of his hair. He is still acting, in the hit series, NCIS, as is Robert Vaughn, seen recently on Law and Order: Special Victim’s Unit. Among the fan-related and series-related material in the two collections are letters from Felton to and from Ian Fleming regarding the series and a letter from Felton explaining that he sent his papers, including scripts, correspondence, photos, business records, advertising, etc. to the University of Iowa so that fans would leave him alone and could come to a central location to see the treasure. In the Mendoza collection, there are card and board games, fan t-shirts, convention materials, fan correspondence, newsletters, and a wealth of merchandise and memorabilia. 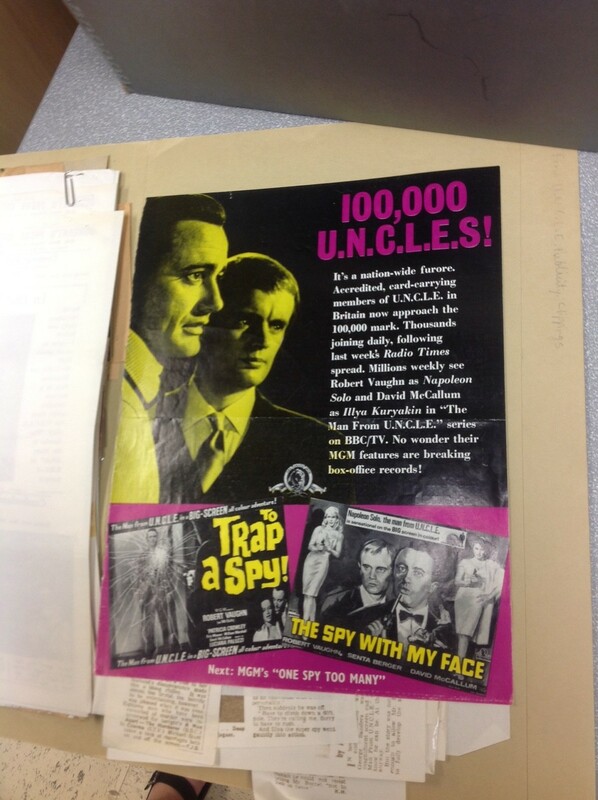 Want to get started exploring Man From U.N.C.L.E related collections in the University of Iowa Special Collections? 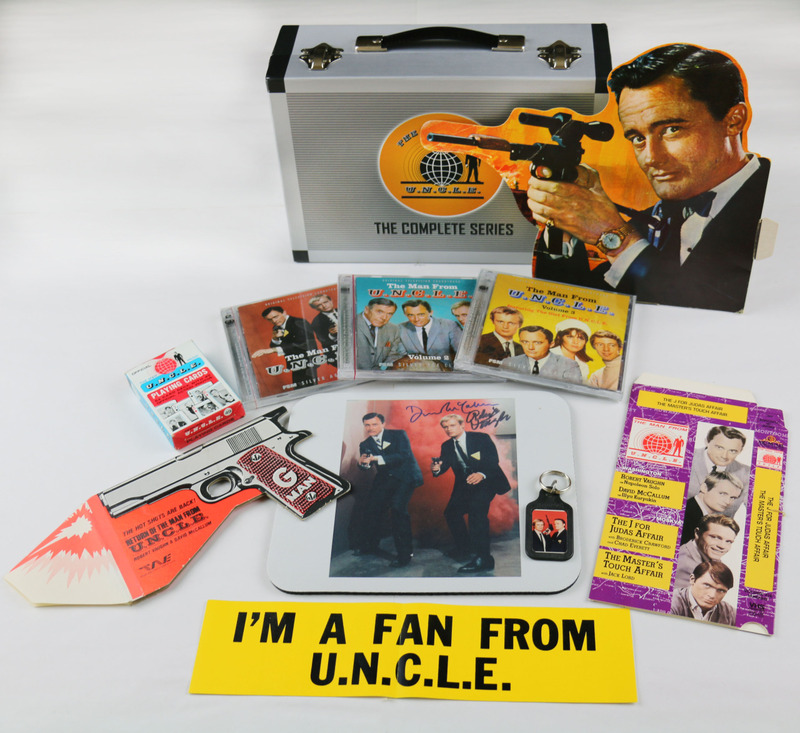 Scripts, photos, memorabilia, and documentation relating to the making of the Man From U.N.C.L.E, its reception, and its fan communities from the series’ executive producer Norman Felton. 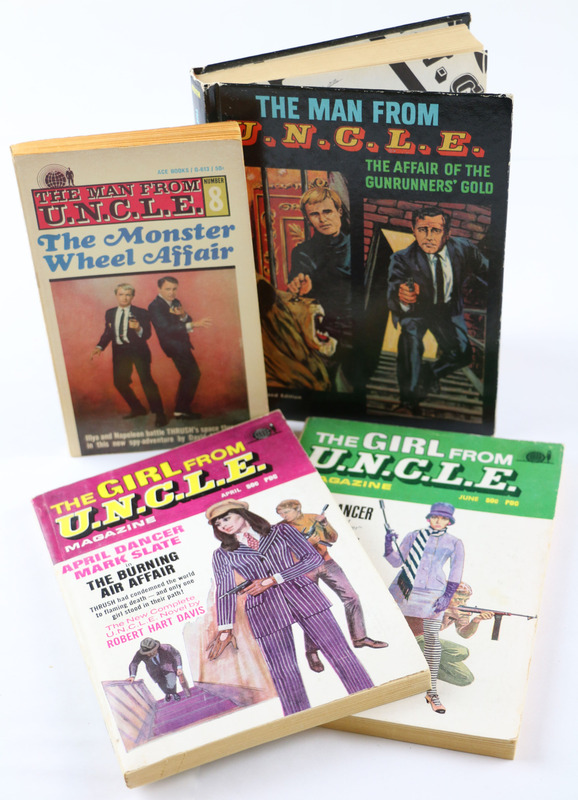 Collection of materials related to the actor David McCallum, assembled by the president of his official fan club. 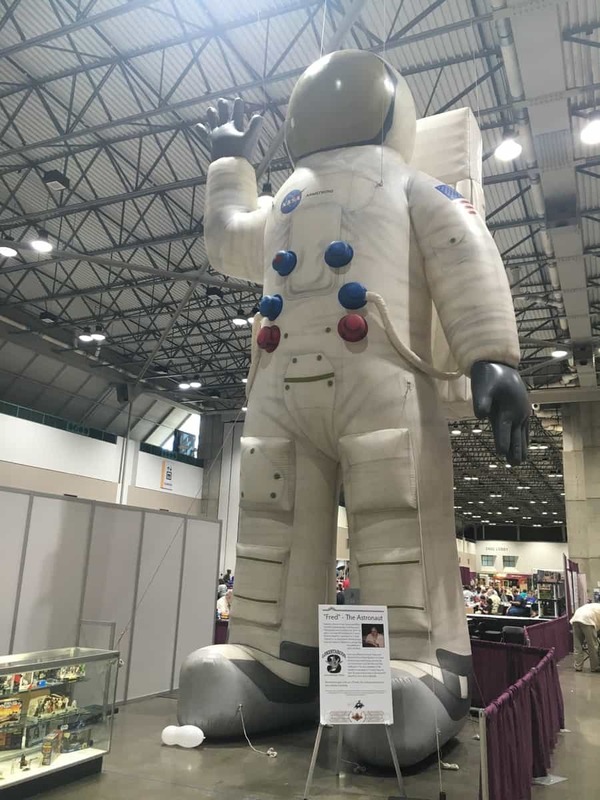 Every year at the ICON Science Fiction convention in Cedar Rapids the organizers collect fan created artwork, crafts, and donated memorabilia which are auctioned off to support charities and projects. 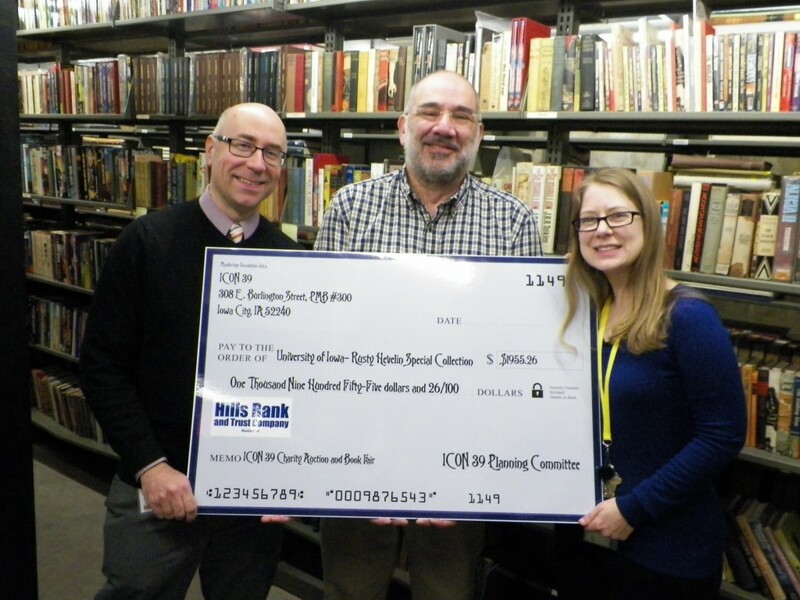 Last fall, the chosen project was The University of Iowa Libraries’ initiative to digitize the James L. “Rusty” Hevelin Science Fiction collection, an especially meaningful choice to the community, resulting in an outpouring of donations and fast-paced bidding wars. 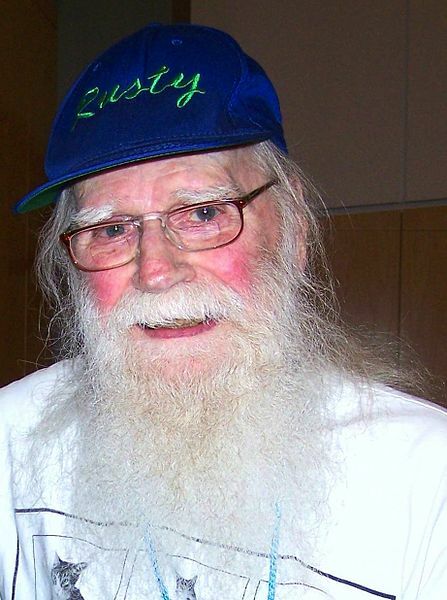 Rusty Hevelin was a science fiction fan, pulp collector, fanzine creator, huckster (a dealer at conventions), and voracious reader for most of his 89 years. He was also involved with the Iowa Science Fiction conventions ICON and Demicon from the time of their founding. 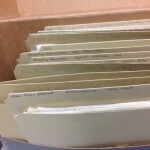 After his death in 2011, his collections came to the University of Iowa Special Collections where a recent unprecedented initiative to digitize around 10,000 of the earliest fanzines from roughly 1930s-1950s has begun. The University of Iowa Libraries’ Community is deeply grateful for the generosity of the science fiction community and for their support. The next ICON science fiction and fantasy convention will be at the Cedar Rapids Doubletree on October 16-18, 2015. Details here. This past weekend, the Zine Librarian (un)Conference happened here in Iowa City! Amongst the lively discussions and seminars was a Historical Zine Making Technologies Workshop demonstrating and using obsolescent printing techniques including hectography, spirit duplication, and mimeography. You may be asking yourself, at this point, what the heck a hectograph is…and we’re here to show you. By the end of this post, you too, could be on your way to zine making madness! First, a hectograph a.ka. a gelatin duplicator or jellygraph, is a smooth piece of gelatin used to make multiple prints off a single master sheet. 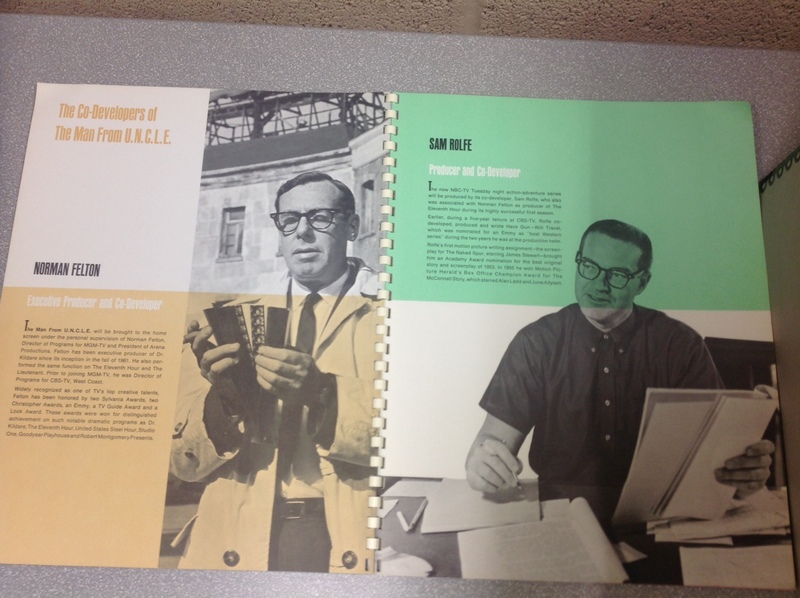 We’ve got great examples in many of our zine collections, including, but not limited to the Hevelin collection. 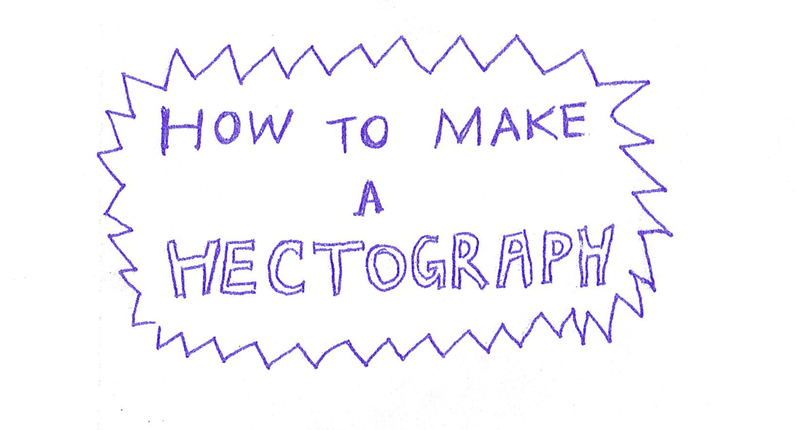 Second, making and using is a hectograph is incredibly simple. The only difficulties I had in using this out-moded technology was locating a couple of the supplies. I recommend using internet shopping sites to track down the harder to find materials. I got the recipe for the gelatin here. The mixture you end up with should be transparent and slightly yellow in color. Take your transfer paper and draw whatever you want to print on it with a firm hand and a hard stylus (a pen usually works). Make sure that your lines are being transferred to your master sheet. You can also use the transfer pencils to add designs directly to the master sheet. 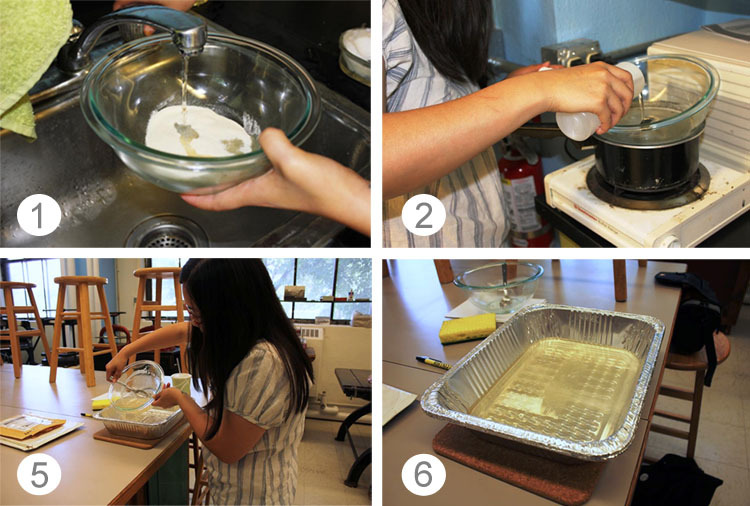 Take your master sheet and place it FACE down on the solidified gelatin surface, making sure there are no bubbles and that there’s good contact between the gelatin and the master. Let the master sit for awhile – I read somewhere that 1 second of sitting for every copy you want to make is a good rule of thumb. You’re ready to print! 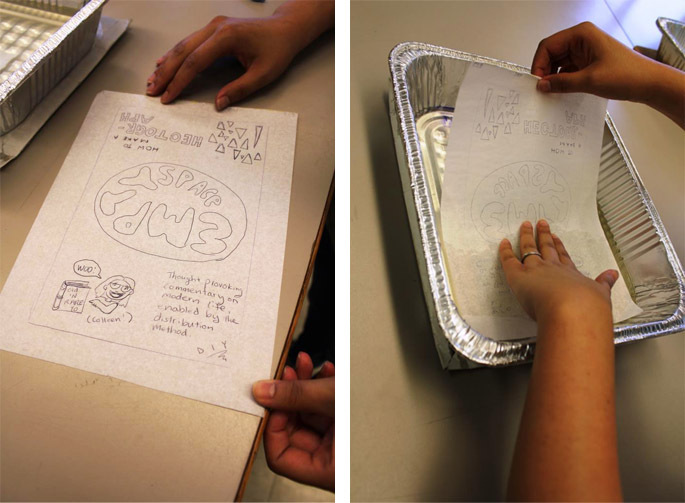 Place your paper on the gelatin surface and rub the back, much like the master sheet. Pull the sheet up and voila – you should have a duplicate of your master! Keep going until the prints get too light to read. The master copy on transfer paper getting placed face down onto the gelatin surface. Look at this awesome gif that Colleen made of pulling up a print off the hectograph here. Here’s a sweet pile of prints we pulled from the hectograph! 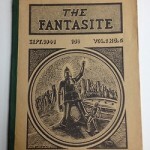 The James L. “Rusty” Hevelin Collection of Pulps, Fanzines, and Science Fiction Books in the Special Collections of the University of Iowa Library is a manifestation of fandom, a subculture of shared interest, networking, and activity that grows up around almost any subject. Fandom demands more of its participants than merely liking something; they must become involved. Science Fiction fandom is unique because of its heavy influence on the shaping of the literary genre that spawned it. This post looks at two early examples of Rusty Hevelin’s fan activity as a writer for fanzines. 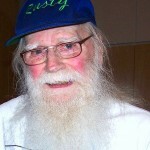 Rusty was a science fiction fan from his teen years in the late 1930’s until his death in 2011. He participated in all aspects of fandom, including fan groups (LASFS, and PSFS), fanzines (H-1661, StefNews, Nebula, Aliquot, Badly, etc. ), conventions, as a fan, “huckster” (“dealer” in fan lingo), and organizer, and avid collecting. 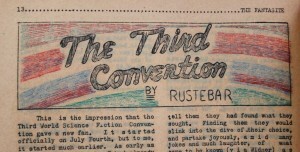 In 1941, when he was nineteen, Rusty hitchhiked from L.A. to Denver to attend Denvention I, the third Worldcon, or World Science Fiction Convention. 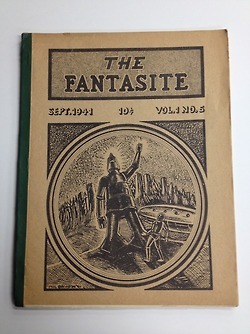 He wrote a report of the convention afterwards (as “Rustebar”) for the September 1941 issue of The Fantasite, a zine Phil Bronson edited for the Minneapolis Fantasy Society. Happy International Zine Month! Throughout July Special Collections & University Archives will be celebrating by highlighting zines from our collections. Every day this month, Olson Fellow (and zine enthusiast) Kalmia Strong will be selecting a zine from our collections to share on Twitter. 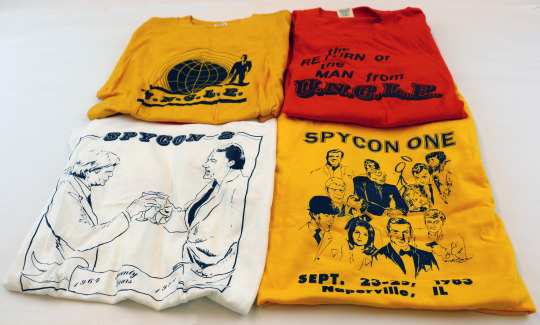 Follow us @UISpecColl to see her picks, which will cover a broad range of subjects, styles, and locations. We will also have a cart of zines in the reading room for drop-in reading. Anyone is welcome to come in and spend a few minutes (or hours!) browsing the zines. They include art zines, Riot Grrrl zines, science fiction fanzines, and zines made in Iowa, among many others. 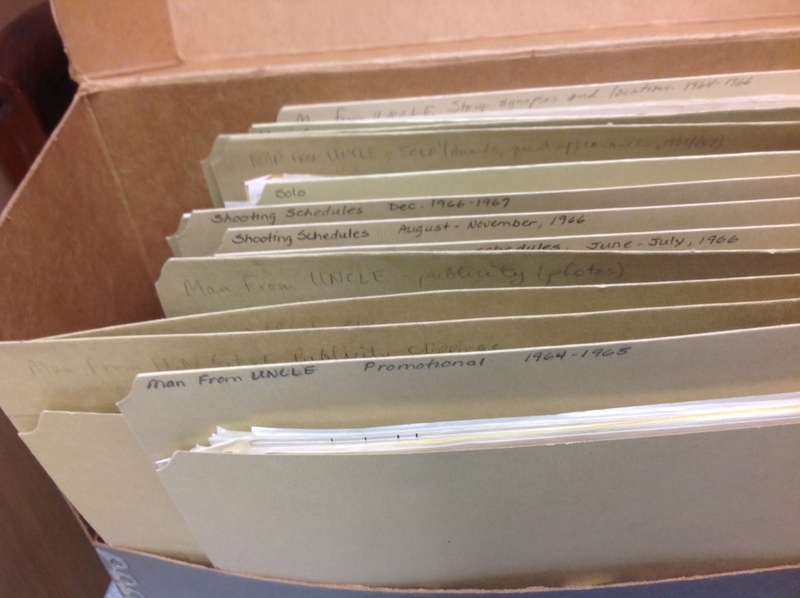 Did you know that we have approximately 20 collections of zines adding up to over 500 linear feet? They range in subject from sci-fi to food to punk to comics to feminism, and date from the 1940s to the present. 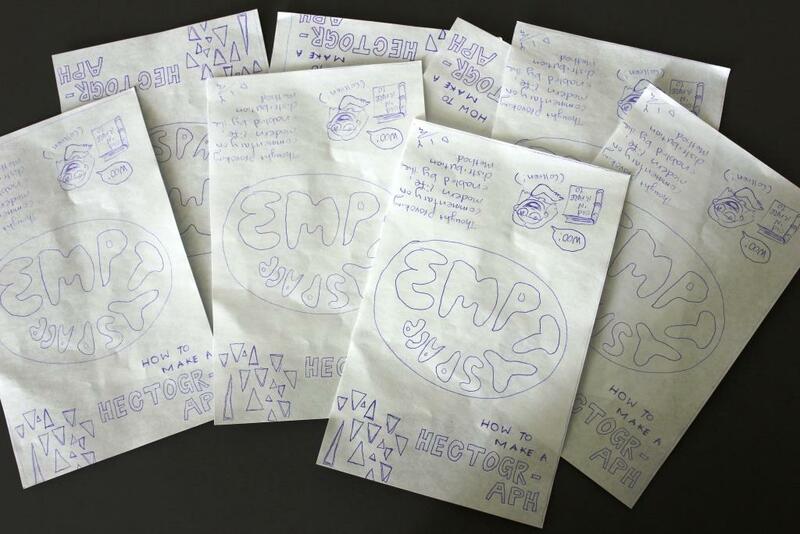 We also regularly receive donations of zines. Two recent acquisitions are several issues of Dishwasher and Moonbeam #3 .These zines are very different in focus but are both excellent examples of the scope of self-produced publications, produced on a copy machine, bound with staples, and distributed through the mail for little more than the price of materials. 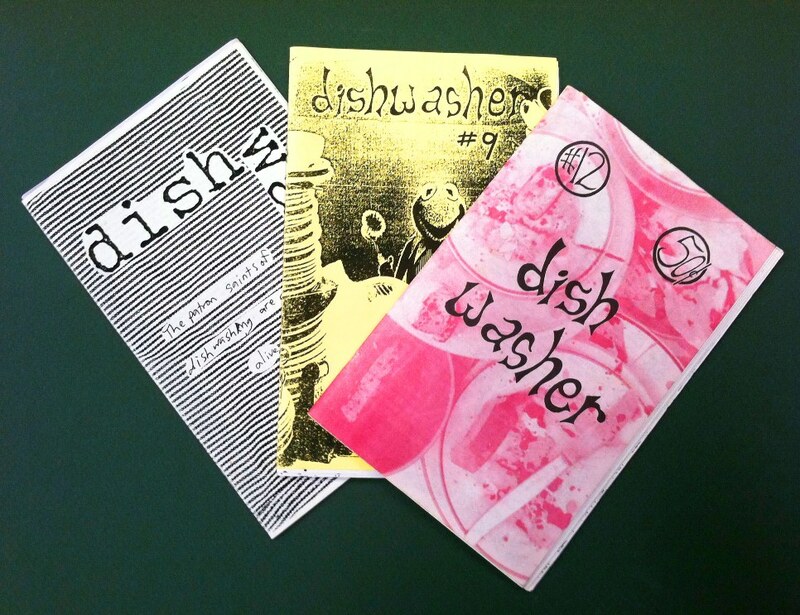 Dishwasher was published by Pete Jordan (AKA Dishwasher Pete) in fifteen issues from 1989-2001, and chronicles his journey across the United States washing dishes in every state. By turns tongue-in-cheek, political, and personal, it includes stories of work as a dishwasher, contributions from other dishwashers, collage, comics, quotes, and movie reviews (focusing on dishwashing scenes, of course). Moonbeam #3 was published in 1978 by Deborah M. Walsh, and was one of the first Star Wars fanzines created after the film was released in 1977. It is an anthology of contributions of original art, fan fiction, and poetry, with a focus on Alec Guinness/Obi-Wan Kenobi. 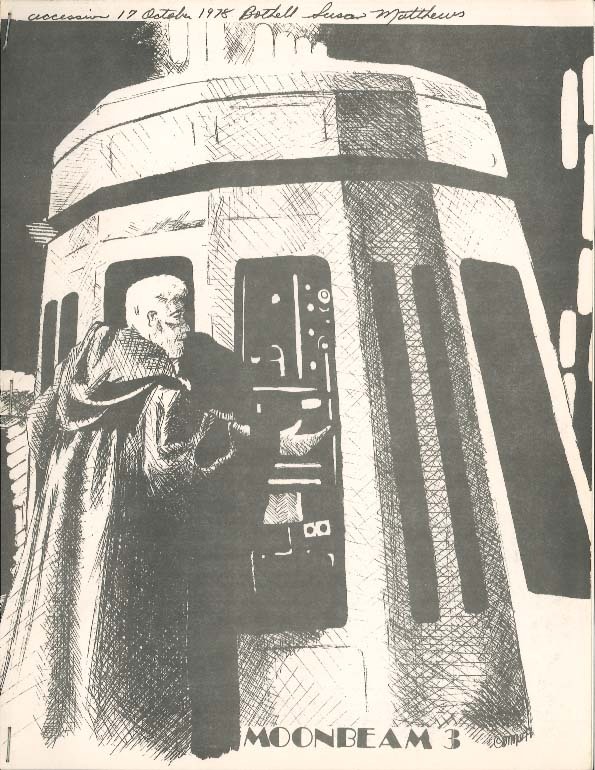 It is particularly interesting to look at early Star Wars zines because of the great excitement and speculation about characters and plot that would be revealed in later films and because of the complicated relationship between Twentieth Century Fox and the growing community of Star Wars fans. If you’d like to learn more about zines or browse our zine collections, check out our Zine Resources page, or stop by the department on the third floor of the Main Library 8:30AM-5PM Monday through Friday. Comics: Entertainment or Social Critique? Are comic books a good vehicle for social critique? Is Superman’s romance with Lois Lane trying to tell us something about our own relationships? Can comics promote racial inclusion? 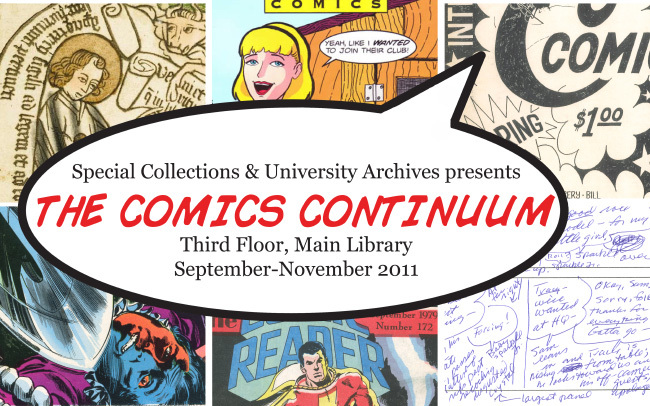 As a spinoff of the recent symposium on graphic language, Special Collections and University Archives presents The Comics Continuum, an exhibit from our collections available for perusal, research and teaching to the university community and beyond. The exhibit is open on the 3rd floor of the Main Library through the end of November 2011. While viewing the exhibit, please see the labels for any collection numbers (MsCs) that you may be interested in browsing. Once you are done with the exhibit, we encourage you to move beyond the glass cases, come in Special Collections, and request to look at some of our comics collections in the Reading Room. Here are some of the items you can see in our exhibit. As a genre, comics have the potential to treat political and social issues in ways that promote free and open discussion. The realization of this potential has been shaped by factors such as the contemporary social movements, the vision of the graphic artist, the imperative for business profit, and the expectations of fan communities of entertainment value or social commitment. One of the most important issues of the post-World War Two United States, race relations were treated by comic books with varying degrees of seriousness and sophistication. 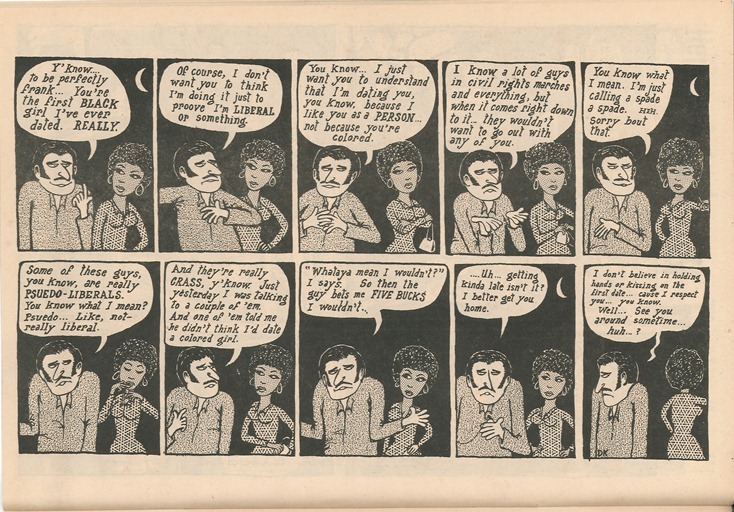 Some, like this 1969 issue of the underground Mom’s Homemade Comics, poked fun at liberals for their ambiguous openness to racial inclusion and relationships. 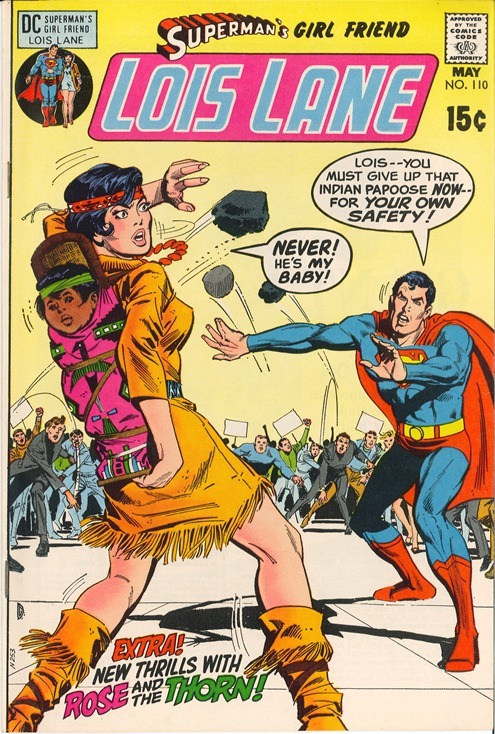 More mainstream comics such as this May 1971 issue of [Lois Lane] Superman’s Girl Friend used the events of the radical American Indian sovereignty movement to explore issues of motherhood and interracial solidarity. One of the first African American characters to become a superhero was Dr. William Barrett Foster, who, according to his origin blurb, “pulled himself up out of the Los Angeles slums,” to earn several doctorates and work as director of one of the nation’s most prestigious research labs before becoming a 15-foot tall crime-fighting giant. 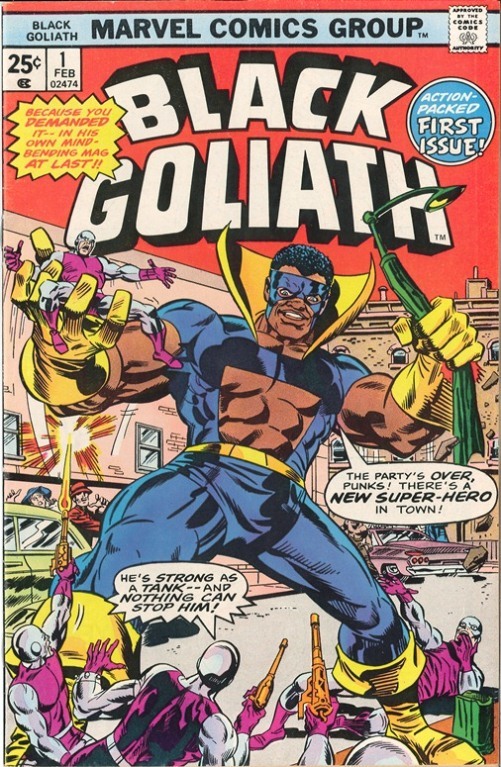 As in this February 1976 issue of Black Goliath, Dr. Foster’s transformation into a superhero potentially resonated with American anxieties about urban “race riots,” and with the problems of social mobility and the black middle class. How long have comics been around? Do comics reflect or shape our society? What was the Comics Code Authority? How do comics build community? As a spinoff of the upcoming symposium on graphic language, Special Collections and University Archives presents The Comics Continuum, an exhibit from our collections available for perusal, research and teaching to the university community and beyond. Our exhibit places comics in a continuum of graphic narrative which encompasses the amateur, commercial, and the artistic, and illustrates their appropriation by countercultures, artists, fans, educators, social movements, and even the U.S. government. Besides placing in their historical context some of the mainstream icons like Wonder Woman and Captain America, the exhibit shows how comics make communities through their production, circulation, consumption and collection. 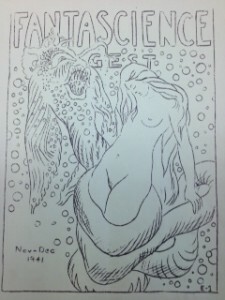 The exhibit will be open on the 3rd floor of the Main Library from the end of September through November 2011. While viewing the exhibit, please see the labels for any collection numbers (MsCs) that you may be interested in browsing. Once you are done with the exhibit, we encourage you to move beyond the glass cases, come in Special Collections, and request to look at some of our comics collections in the Reading Room.